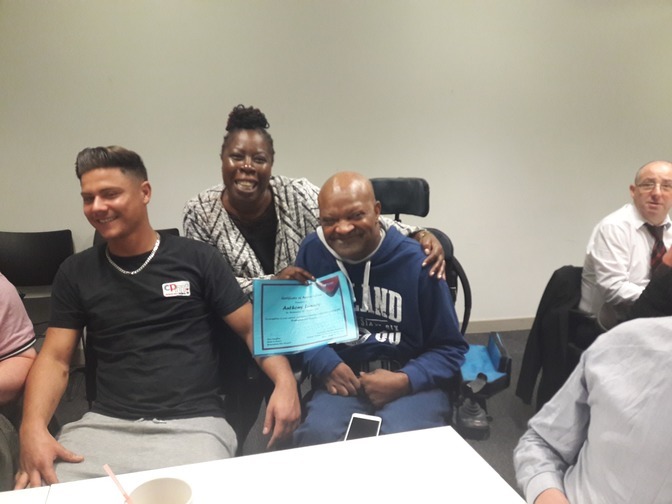 Yesterday, Wednesday 22nd August some of our citizens from Cerebral Palsy Midlands had the great opportunity of meeting Cabinet Member for Adult Social Care and Health, Councillor Paulette Hamilton. This meeting was to acknowledge all of the work that has been done together with Birmingham City Council, local Councillors, our citizens, other disabled members of the community, our community day-care centre Cerebral Palsy Midlands and many other organisations in the local area. 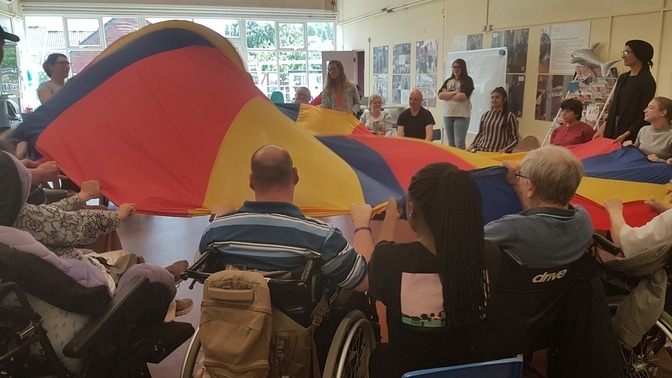 Together, we all have been working on a 'Co-production', that being, a partnership to improve the support services for adults who live in our community. It's a big project, lots of great work has been acheived and there is of course more to be done. Yesterday, Councillor Hamilton acknowledged the time and effort that our people had given to the project, as of course, this will help the developments and improvements that take place in our city. 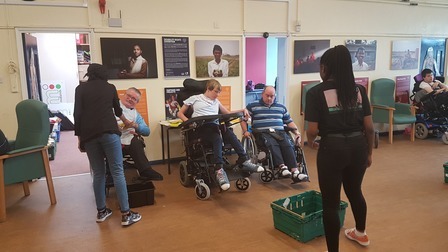 Cerebral Palsy Midlands (CPM) support National Citizen Service (NCS) The Challenge Network in Birmingham who offer short courses to young adults aged 17 years-old. NCS offer a 3-4 week experience that helps build a young person and their confidence to better prepare them for life. They get to live away from home, develop skills and meet amazing people. 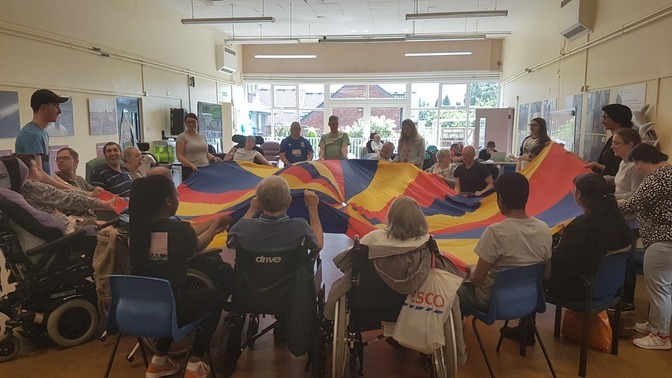 Included in the course is a three day placement at a charity organisation like ourselves, where they get to work with disabled adults, develop their work experience, enhance their communication skills and organise events. 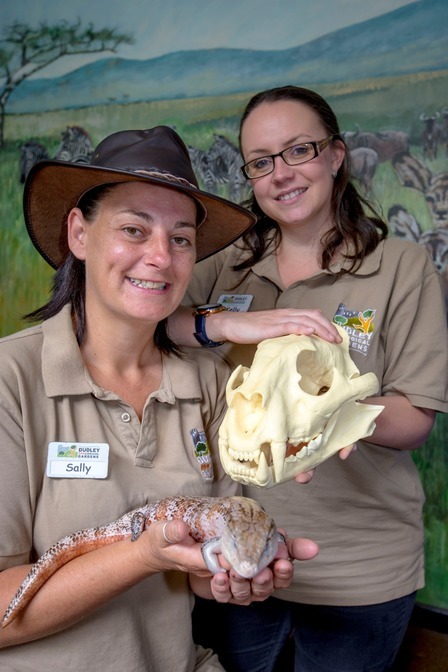 Can you support our Summer Sizzler? Would a dance group like to perform? Are their any talented acoustic musicians that could play in our garden? Could anyone help with raffle or tombola donations? Would you be interested in having a stall and have your own table? Can you do glitter tattoos or henna? Can you contribute by making some home made cakes for us to sell? 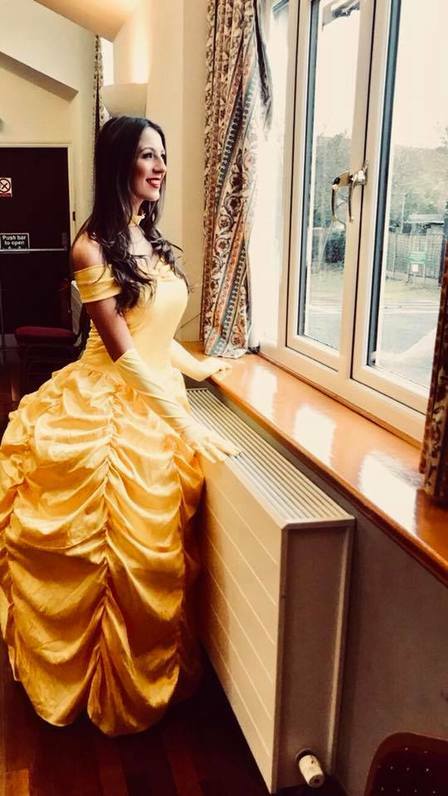 We want this to be a successful event, in our local community and everyone is welcome in, we are an inclusive centre, we will have lots of games, a BBQ, Dudley Zoo small animals, we will have Princess Belle to meet and grab a selfie with. 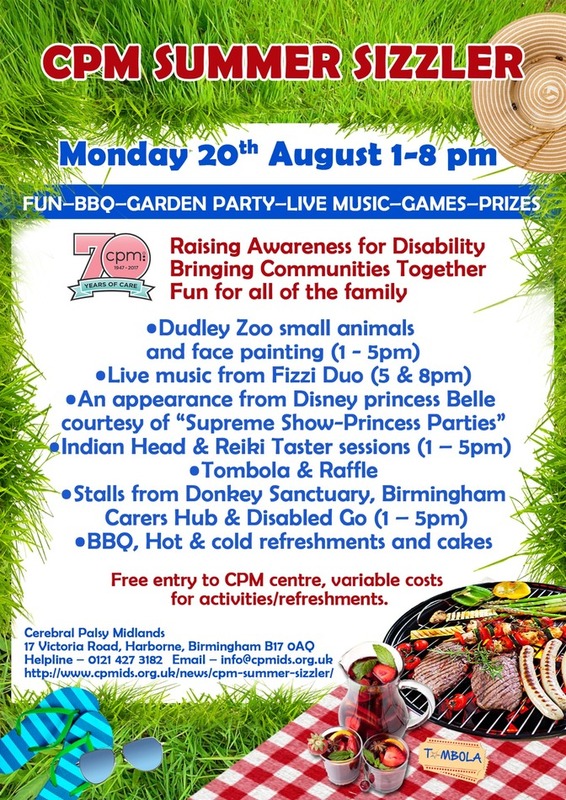 If you can support us comment below or email me sarah@cpmids.org.uk or call 0121 427 3182 ext 3. 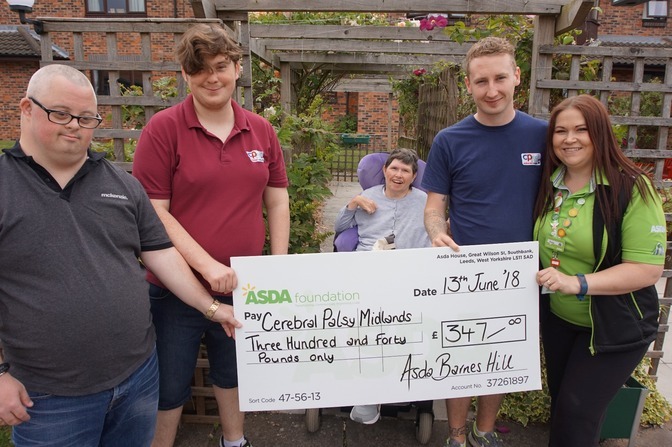 Getting our disabled citizens out into the community and to have great opportunities is a huge part of the work we do at Cerebral Palsy Midlands. Recently our clients who are huge football fans were taken to St George's Park, which is the FA's National Training ground where the English Football Team train and home to the England Football Squad. 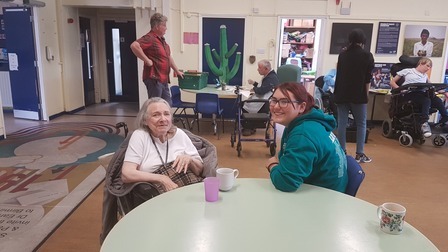 Carer David Pittaway said; 'They really had a great time, it was a fantastic opportunity and they hope to get more chances like this." They watched an Ireland vs Denmark Football Match and had front row seats. And to make their day even more magical, they also managed to get a picture with English Manager Gareth Southgate (picture right). 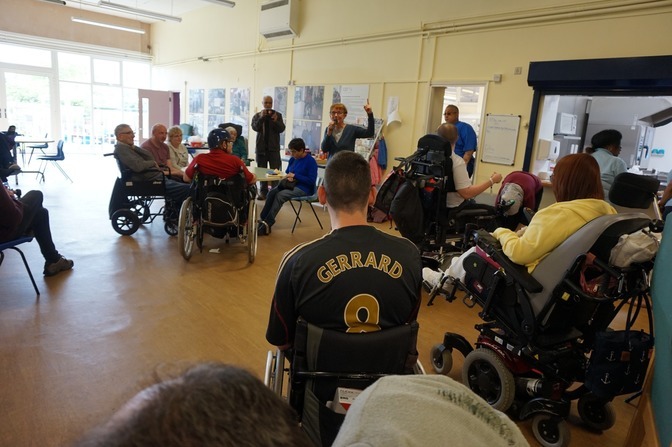 So we thought today would be a great day to wish Gareth Southgate and the England Football Team all the best of luck from all of us here at Cerebral Palsy Midlands in their match later tonight against Tunisia. We will be routing for you to win! Another visit last week took them to the Pirelli Stadium at Burton Albion FC where they watched a Portugal play Sweden football match. There a few pictures below from the two visits. These opportunities really do make all the differences to our clients and we will continue to keep out clients accessing the community in this way. 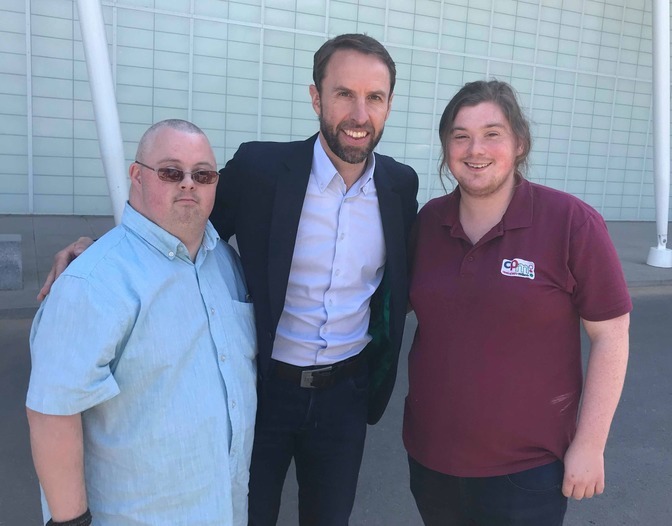 Pictured above: English Football Manager Gareth Southgate with Paul and David from Cerebral Palsy Midlands at St George's Park, the FA National Training Centre. 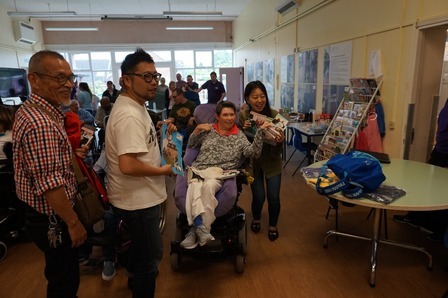 Image shows our community of people at Cerebral Palsy Midlands and our Japanese guests; Shun Fujiwara from Amagasaki City, Hyogo prefecture, Masayuki Kiyota, Shun's carer and the founder of community based Non profit organisation "Moon and Wind" to provide care services. Seigo Nishimoto, Founder of Charity Shop "Free Help" in Kobe, Japan. Chihiro Harada, Ex-staff of Free Help, now working in Sri Lanka as a Japanese teacher for orphans. Ken Ricardo Marotta, my son of 12 years old and Ayako Nishiwaki, ex-social policy officer at Hyogo prefectural council on Social Welfare in Japan. 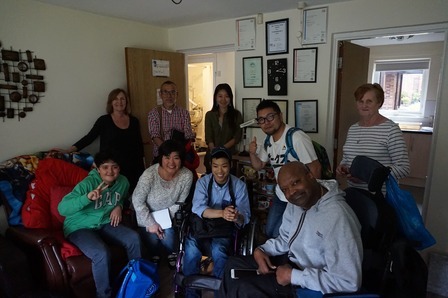 On Wednesday 30th May Cerebral Palsy Midlands had a visitor, Shun Fujiwara, with cerebral palsy and his family, all the way from Japan. 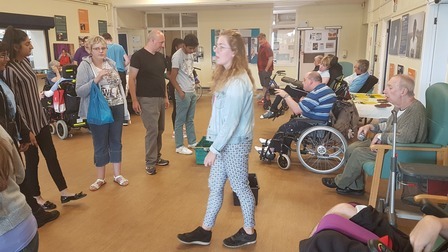 The group had looked for organisations in the UK to visit and found Cerebral Palsy Midlands through our interactive website. 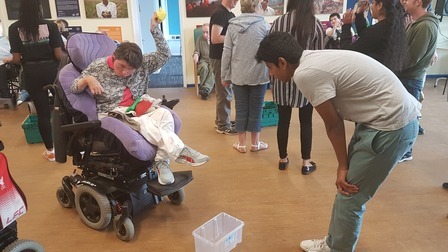 Shun and his family contacted our Centre Manager Gary Watson and planned their visit to the UK to include a whole day with our community at Cerebral Palsy Midlands. 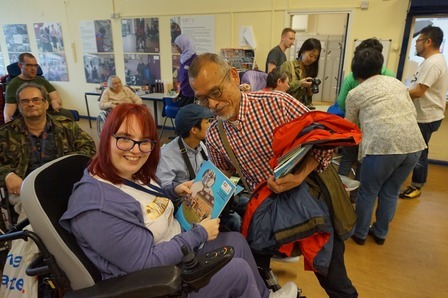 Our visitors wanted to meet others with disabilities, learn and understand what services we have in place here in the UK and to be inspired. They wanted to take their experiences back to Japan to help establish a better quality of life for their community of people. 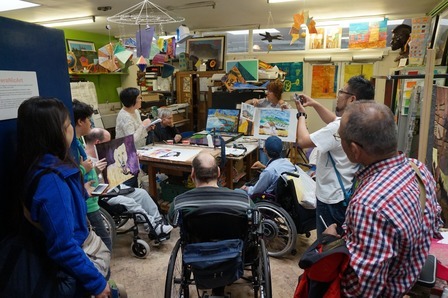 We were really pleased to have our guests, we gave them a tour of our facilities at CPM showcasing our Art tuition, Being Heard talented group and tai-chi instruction. We had a tradition English ‘Fish and Chips’ on the lunch time menu and Shun got to see some of the local residence where our citizens live independently nearby. 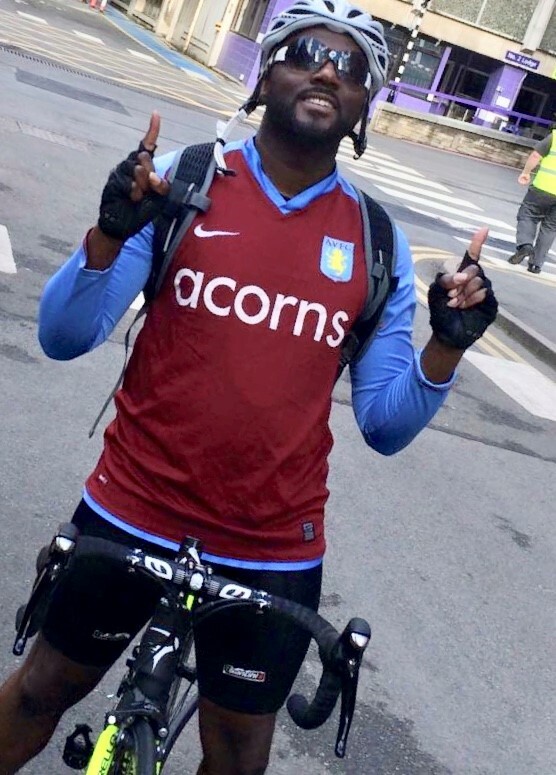 Our Mondelez Community Champion Michael Huggins this Saturday will be cycling around 118 miles from Villa Park, the official Aston Villa Football Club stadium all the way to the Wembley Stadium. Cycling with a ticket to then watch the Championship Play-Off with Aston Villa vs Fulham Match. The distance from Villa Park to Wembley is around 118 miles, I will be leaving Villa Park around 4am so I can gain good time on the empty roads and also give myself some time if I have any issues with the bike. The winning team will make it back into the Premier League, so of course I want Villa to win! But supporting the charities that I truly care about is my main motivation and will keep my cycling on Saturday! 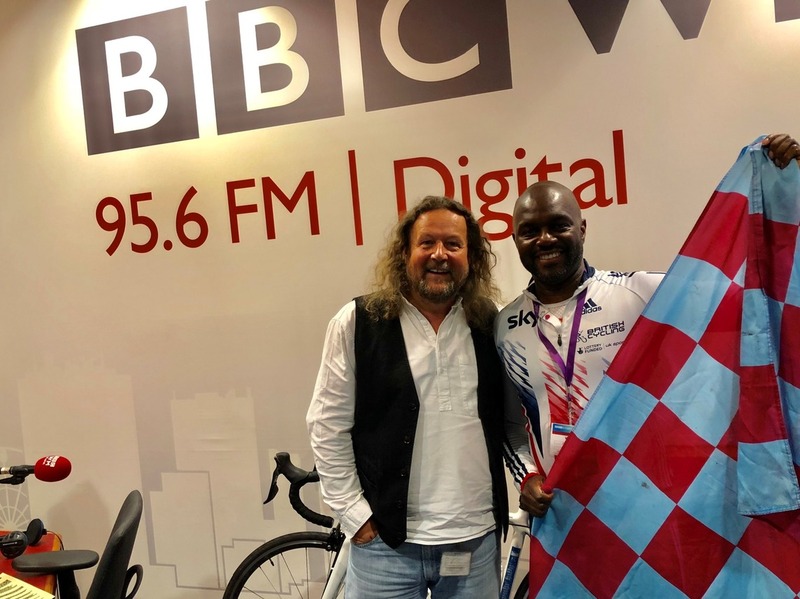 Here is an image of our MIchael Huggins just after his interview on Radio WM Friday 25th May, the day before cycling from Villa to Wembley! When the skys open up we’ll be there When this talk of relegation we’ll be there But when you put it all together No matter what the weather You know we’ll be there we’ll be there Some day your going to do it And we’ll all be there to see When you become the champions will be there A poem from Michael's Childhood. One for Aston Villa! 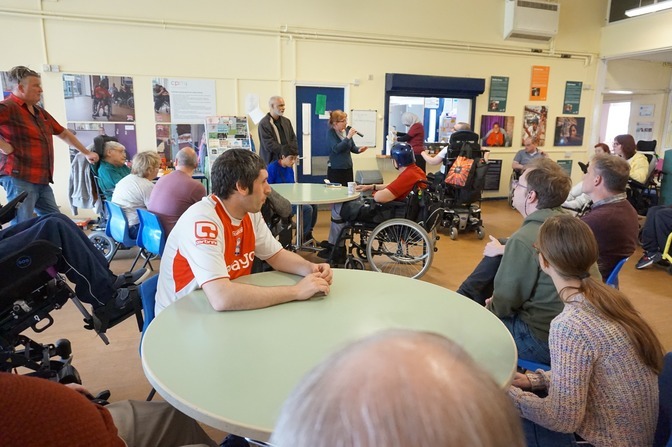 We really enjoyed having Fran and Rajan from Birmingham City Council at CPM talking about the struggles of people with disabilities in rural India. We found out about poeple's strategies to get involved in community life and claim their statutory rights. The opportunity is still here at CPM for a little while longer for our community to view. 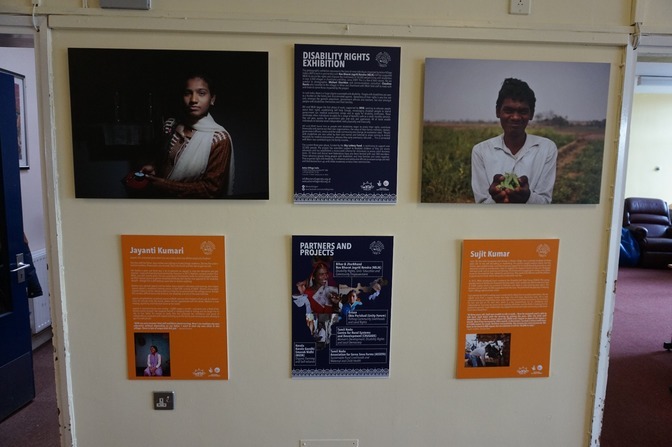 Anyone is welcome to come in and see this work and find out more. John Reed - The "Storytellah fellah" came to CPM! 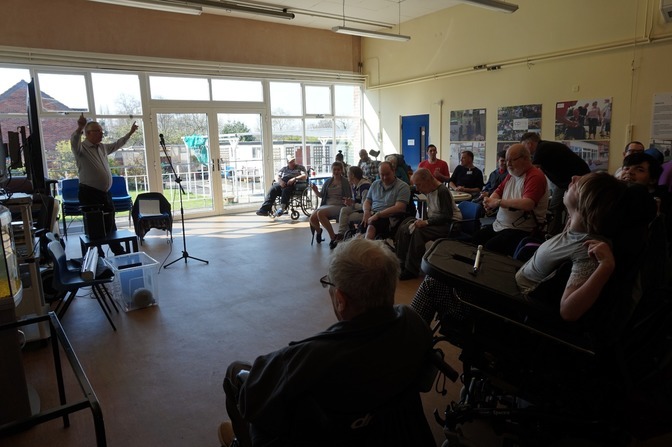 On Friday 20th April we had an exciting visitor come to see us at Cerebral Palsy Midlands and he was called John Reed, also known as the "storyteller fella" who came to tell us all about The Beatles Story. John Reed is an experienced story teller and mixes together music with stories to produce an interesting, funny and entertaining time for his audience. It's a very good way of reducing loneliness and social isolation as well as improving general well being. We learned about the history of 'The Beatles' Music mainly between the years of 1962 and 1966 which was when the group were at their fame. We listened to many tracks and remembered good memories, songs we listened to included; 'Love me Do', 'From me to you', 'She loves you', 'I wanna hold your hand', 'Hard Days Night' 'Help', 'Yellow Submarine', and 'Eleanor Rigby' and more. With over 800 million tracks sold and more number ones than any other musical act, it was interesting hearing of how they come to fame.